Why do a direct mail campaign? Despite advances in IT and communications, printed promotional materials continue to form a major part of many businesses’ core marketing activity. A recent survey by PPD revealed that most respondents considered print material to be ‘most important’ or ‘of equal importance’ within their marketing mix. Print remains popular across all age groups – many over 55s are still not IT-literate! Print enables you to get your marketing message into the hands of potential customers in a cost effective manner. With print, you can target more effectively – reach those you want to, at the times when you need additional business. Unlike the internet, leaflets or flyers can be kept as reference material, or passed on to other people, increasing the opportunity of repeat business. It is easy to monitor the effectiveness of print by some form of tracking” device: e.g. redemption vouchers, special offers, etc. Print can form a highly effective, value for money element of your business’s marketing activity! Choose the best quality of paper you can afford. 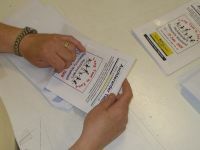 Plan the size of your leaflet carefully – ideally one third A4 or A5. Use a graphic designer if possible – a well-designed brochure is a powerful selling tool, so it’s worth the investment. Use the top third of the leaflet for maximum impact of your key message. Remember to tell people where you are as part of your site name e.g. Floors Castle, Kelso, Scottish Borders. Get some high quality pictures taken - a good quality pic will sell a product more effectively than any number of words. Don’t use too much copy! Tailor your marketing message to your target audience. Include key information eg. location, opening times, contact details, website address. Try not to date your information. Proof check your leaflet carefully, and always ask to see a full set of colour proofs before printing. Plan your distribution campaign before you decide on the print run. Ask your printer to package your print securely, and in sensible-sized boxes. Decide what type of market you wish to target. Which geographic areas do you wish to cover? When do you want your campaign to start / finish? What type of sites do you want your leaflet sent to? How much of your print run is to be used for your mailshot? What budget do you have available for your mailshot? Make informed decisions about what works for your business and what doesn’t. Make your marketing budget work more effectively. As a result you will waste less money on a promotion that doesn’t work! Coding system – ask enquirers to quote the code or reference when they phone. Redemption vouchers or coupons eg. hand in this coupon at ticket desk to claim free cup of coffee etc. Special offers – 2 for 1, 10% discount etc. Direct mail, company mailshots, database management. New e-business customer services online system for ordering stock.